I have written previously about luxury brands’ adoption of digital campaigns, for example designer Marc Jacobs’ MarcFam which encourages consumers to interact with the brand online via Twitter and Instagram. I read with interest about the latest instalment of luxury jeweller Tiffany’s digital campaign “What Makes Love True,” which has adopted a similar approach in terms of digital user interaction. However this campaign, based on the concept of the art of love and romance, invites users into a world charged with emotion, presented in a highly immersive digital environment. 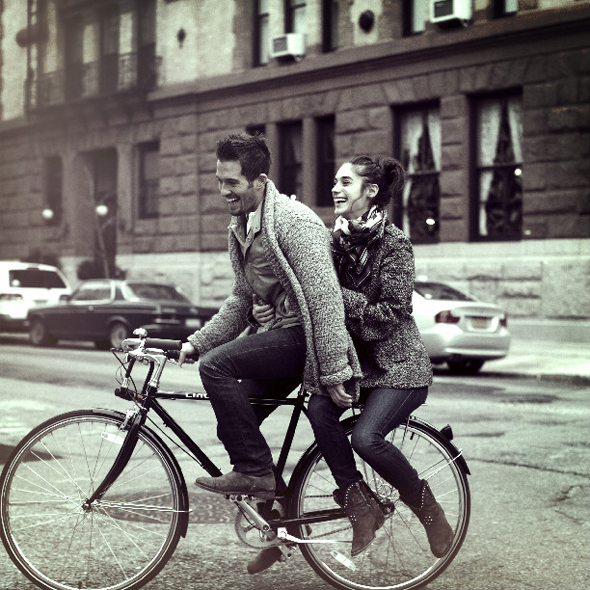 The first part of the campaign incorporates brand and user created content – videos of consumers narrating tales of “true love,” an interactive map where consumers share locations where they have experienced romance, and additional filmed content. For the second part of the campaign, launching next week, consumers will be able to upload their own tangible examples of “true love” through a user-curated gallery. I have written in the past on the importance of brands connecting to consumers’ emotions, and this is a very successful association for a brand that wants to position itself as having a major significance at “life-stage” events such as engagements and weddings – with that significance now firmly embedded through its own virtual environment. Chris Ramey, president of Affluent Insights, Miami commented: “Selling product benefits is, today, a failed strategy. Tapping into your prospect’s deep-seated values and emotions is key. “Tiffany understands this marketing evolution as well as anyone,” he said. “Emotive selling connects neurologically to consumers who are disinclined to buy more stuff. Is it possible to keep online luxury exclusive? Luxury executives explain that the internet is too impersonal for their products, which need the human touch. Allowing anyone to buy online can mean a loss of cachet. Luxury firms like to dazzle customers with plush stores and sleek ads, so that they think only about beauty and not at all about price. The web, by contrast, shines a clear light on price. “That’s the last thing I want people to think about,” wails an executive from the watch industry. Still, luxury firms are going online in greater numbers because their customers increasingly want the convenience of ordering online. I don’t think it’s impossible for luxury companies to offer a unique, exclusive experience through the online channel. It just needs to be well planned and thought out, and needs to appeal to the different ways that individuals look at the world and consume luxury. A website that appeals to a Lambda woman in one way and a Theta man in another could be quite successful. 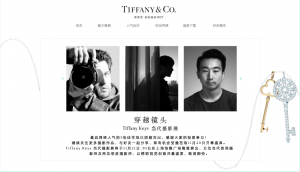 More and more luxury companies are creating mobile phone applications to sell their wares and expose their brand–Tiffany & Co. just released their engagement ring finder iPhone app earlier this month, joining Chanel, Net-a-Porter, and many others. Van Cleef & Arpels has also joined the fray, but their app is different from other apps I’ve seen. Last year I wrote about Chanel and Net-a-Porter apps making it to the iPhone. Since then, more luxury companies are expanding their marketing efforts and finally embracing the online sphere. 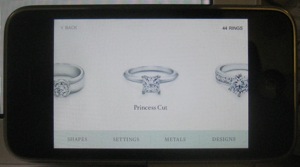 Today Tiffany launched a new iPhone app that allows people (I’d imagine primarily men) to easily browse Tiffany’s range of engagement rings. While one can’t purchase rings directly from within the app, it does offer a decent amount of utility. Users can scroll through all of Tiffany’s different cuts, fixtures and collections for engagement rings — 44 combinations in all. You can also figure out what size you need by placing an existing ring on screen and matching it to a digital sizer. And if you need more help, you can call or set up a meeting with a representative from Tiffany from within the app. The app doesn’t do anything more than what Tiffany already offers on its website, but by offering an app, I believe Tiffany will expose its rings to a larger number of (predominantly younger) luxury consumers who have iPhones. These consumers are discerning and like their luxury on demand–they should appreciate the ability to browse rings wherever they are. People can even design rings and then share them via email and Facebook. These sharing functionalities will appeal to Theta personalities who will want their ‘marrying friends’ to know that they fit in and are getting rings. That it’s still possible to design a very unique ring within the app will help it appeal to Lambda personalities. Tiffany was in the news this week, not for a new line of diamond rings or earrings but because it lost the long-running lawsuit it’s had with eBay about the sale of counterfeit Tiffany goods on the site. Tiffany maintains that eBay knowingly encouraged sellers to dilute Tiffany’s value and trademarks by not putting a stop to counterfeit Tiffany listings on the site. Rather than resting with eBay, the burden for identifying counterfeit goods rests with Tiffany, who have to report counterfeit listings to eBay and have eBay remove them. EBay argues that like YouTube it’s up to the trademark holder to report false listings, and they already take enough action against counterfeit items because these are bad for their marketplace. This American ruling is interesting because it diverges from recent findings in European courts. In Germany a ruling for Rolex found that eBay must make greater preventative measures against the sale of counterfeit Rolexes, and in France eBay was ordered to pay Louis Vuitton 40 million euros in damages for the sale of counterfeit goods. Counterfeit goods damage brand value–if discovered, they’ll upset people who purchase them and receive them as gifts; they mock the effort that people make to show their love and appreciation for one another. The takeaway from this case is that one needs to be careful when make purchases from a source that hasn’t been completely vetted. When a deal sounds too good to be true, it probably is. When we initially envisaged this connoisseurship series, we thought there would just be four posts (the definition of connoisseurship, aspects with which to engage an object, connoisseurship’s academic legacy, and sham connoisseurship), but the material keeps coming. In this fifth post, we discuss value’s place in connoisseurship. A great example of a modern connoisseur is Mark Resnick. A vice president at Twentieth Century Fox, he (along with his wife) has amassed a very highly-regarded collection of American posters dating from the 1890s. In an interview from last November, Mr. Resnick said that his connoisseurship of posters ties together lifelong interests in art, commerce and popular culture. I collect posters for the love of it. Not a day goes by without my trying to expand my knowledge—for its own sake—of graphic design. That isn’t to say I’m not rather businesslike about my collecting. I have to be, in order to build and manage what is now getting to be an archive. If there’s a “recipe” here, I think it’s to combine a sharp eye, deep knowledge of the material, and solid business skills. The collection’s breadth means there are few restrictions. I do avoid purchasing even great posters, however, if they’re excessively priced. And I’m more cautious still when it comes to “good-but-not-great” posters, posters in poor condition, or posters in a category already well represented in the collection. I know that if I don’t stay focused (price-wise) on posters in good condition that truly fill a gap, then the goals I’ve set for the collection will never be reached. Indeed, as people have more sources of information and more choices, value becomes something that both the not-so-rich and the ultra-rich consider when choosing which objects to appreciate. One can look to the Helium Report to observe this. The Helium Report is a luxury portal that allows users to comment on and compare resorts, private jets, exotic cars and other topics a wealthy connoisseur might be interested in. Throughout the site, the prices of such luxury (and how to calculate a figure when it isn’t immediately apparent) are readily listed. 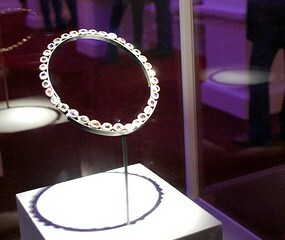 High-end jewelry retailer Tiffany & Co. offers just such an opportunity. 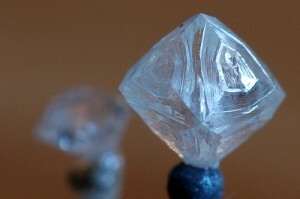 For a cool $1 million, shoppers can select their own 24.3-carat rough diamond from an undisclosed mine and then travel via private jet to the company’s diamond-cutting facility in Antwerp, Belgium. The experience ends in New York, where chief gemologist Melvyn Kirtley will help create the perfect setting and mounting for the bauble. “A stone of this size can produce as many as three stones,” said Kirtley. (Consider it a three-for-one deal.) And, as if there were any question, first-class accommodations are included throughout the trip. This type of experience certainly provides value for the connoisseur who wants something extraordinarily unique and customized. Our next post on connoisseurship will expand on this customization idea, discussing several ways that connoisseurs use their accumulated knowledge to customize and specialize objects. I always enjoy you salient viewpoints and perspectives! So, the very basic point here is, that objects can only be understood in terms of the unique relationship in which they are to the individual. We all aspire to find out exactly who we are, and in order to do that we surround ourselves with objects that can help to enforce that image of ourselves. That, I believe – with inspiration from Baudrillard – is part of the dynamic of consumption. Now, with regard to understanding the phenomena of collecting and connoisseurship among the affluent, the point I am getting at is quite clear. As affluent individuals are more likely than “ordinary people” to have surrounded themselves with objecs that enforce their self-image and thus, they need to expand the concept of what they are by adding something material that is not so easily obtainable – and that is for example, a collection of something (art, vintage watches, etc.). Great post. There is certainly a place for value assessment as part of connoisseurship. We see affluent consumers using the left side of their brains and downloading spreadsheets as part of their review of Luxury Destination Clubs and Private Residence Clubs. But ultimately they join to enjoy the exclusive services and the time with their families.